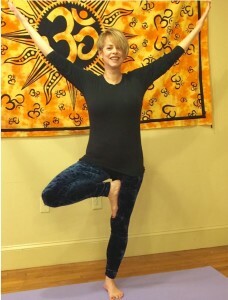 Tobie has practiced many types of yoga since 2001, with a strong background in power and Ashtanga yoga. From her first yoga class, she felt welcomed home to a place that had always been waiting for her return, and she realized that that was something worth sharing. Her goal is to incorporate the same sense of joy and wonder that she derives from yoga to her students. Tobie feels that yoga is accessible to all ages and abilities and she has come to the conclusion that while no yoga is one size fits all, there is a yoga for everybody. She feels that the time spent on her mat has helped her to develop not only an inner wisdom but also a deep sense of trust in her own body. Tobie feels that if we can learn to listen to our body's whisper and respond to what it needs, it won't have to shout to us thru injury or illness. She credits fantastic teachers for her ability to share her passion for yoga in a safe and happy environment that focuses on cultivating kindness by starting with ourselves.